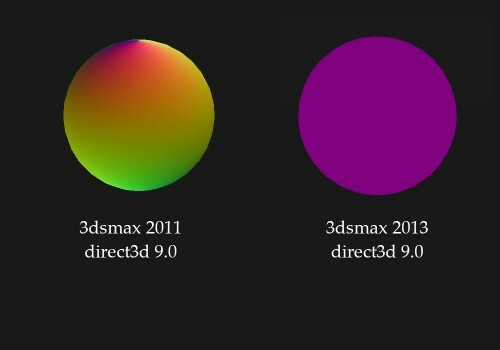 Autodesk has completely broken shading in Max 2013 and 2014. I can not and will not fix this. You should go back to Max 2012 if you want the optimal XS2 experience. Now some technical details for those who wonder. Autodesk has been working on their own Viewport Display Driver to replace the (admittedly aging) DirectX9 renderer. This new Nitrous driver is their main focus, and has broken support for my custom shader. Autodesk’s focus on Nitrous has resulted in bugs being introduced in DirectX9 for Max 2013 which are of yet unfixed for 2014. I have informed the Product Manager for 3DS Max, Frank Delise, he acknowledged my reply and would pass it on, yet no fix has happened. As is clearly visible, Tangent data is returned as a constant for the entire model. This results in incorrect shading. Custom shaders do seem to work to some degree in Max 2014, I will investigate this and see what is possible. For now, my shader does not work properly with it.